Today we take a break from our usual commentary about crypto price movements to review the definition of a Ponzi scheme. We go over some prime examples of how they have crept into cryptocurrency, and why crypto’s anonymous nature makes it a method of choice for would-be Ponzi con artists. We also provide some basic tips on how to spot a Ponzi scheme and prevent getting suckered into investments that sound too good to be true. Since it was first a blip on the media radar, critics have been quick to find parallels between bitcoin investment groups and Ponzi schemes. 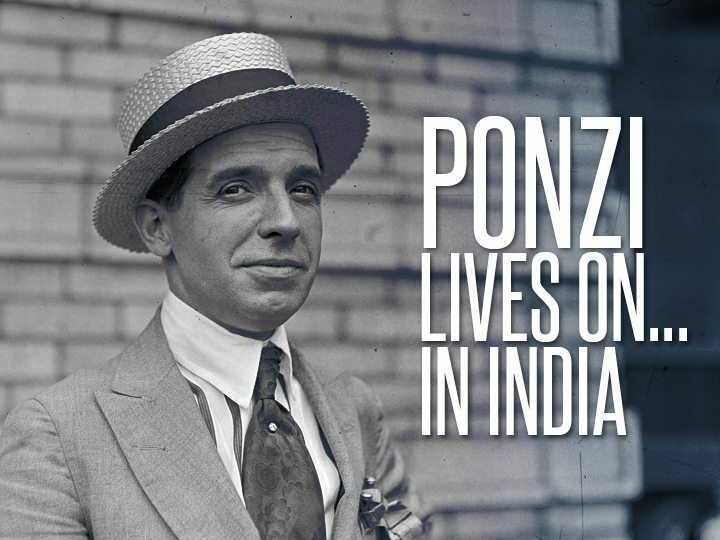 Originated by Italian-American businessman Charles Ponzi in the early 20th century, the scam is characterized by a lucrative promise of astounding returns on investment (ROI) not seen with other investment opportunities. Basically, instead of using collected funds to fuel profitable investments that are then distributed back to investors, the scammer relies on incoming money from new investors to pay returns due to old investors, not actually making any investments at all. 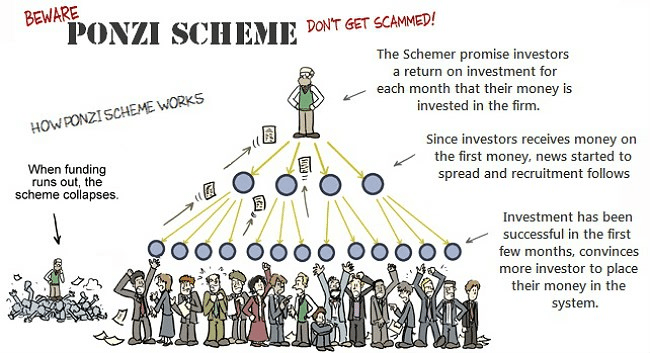 For a Ponzi scheme to be successful, new investors must continually be roped into the system, or the stream of incoming funds gets cut off and the scammer is no longer able to pay anybody, resulting in a collapse of the scheme. (So far, this has happened in 100% of all Ponzi schemes, as they are incapable of lasting forever by design). At this point, the scammer has two options: run for the hills or face criminal charges by the local government. 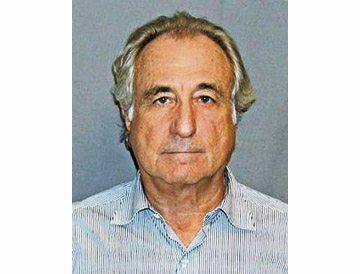 Perhaps the most famous example of a Ponzi schemer is Bernie Madoff, a (once) well-respected Wall Street figure who helped found the NASDAQ stock exchange and was the go-to money manager for New York’s high-fallutin’ multi-millionaire society. Madoff’s returns were rather modest by crypto standards (12% annually), but they were so consistent that the statistical odds of reproducing them via honest trading were in the billions to one. Another red flag was the fact that an overwhelming number of his recorded trades were profitable, so much so that he was likened to a baseball player “batting .966 and no one suspecting a cheat.” It was this abnormal consistency in positive results that the prosecution utilized to definitively prove Madoff was running a Ponzi scheme. In March 2009, Madoff was convicted of 11 federal felonies and sentenced to 150 years in prison, as well as ordered to forfeit over $17 billion in assets stolen from investors. One of Wall Street’s most respected and established tycoons will now spend the remainder of his life in prison, lending credence to the notion that the world’s biggest thieves are disguised in suits and positions of power. Well-known economist and media personality Paul Krugman has stated several times his belief that bitcoin itself is a Ponzi scheme, calling its user base a “cult” who have “paranoid fantasies” about “evil governments” stealing their money. However, he fails to mention who the primary beneficiary of Ponzi scheme is. This is because bitcoin is decentralized and not distributed by any one person, but rather as the result of the programming behind Bitcoin Core. Nobody is responsible for collecting money from investors or paying out returns when it comes to cryptocurrency. Thus, comparisons between cryptocurrency and a Ponzi scheme are limited to the artificial hype and psychological manipulation used by holders to encourage others to buy in and potentially raise its price. Several cryptocurrency investment groups, which are centralized and run by a single individual or a group of individuals, are Ponzi schemes, roping in gullible investors by promising to pay out huge, unrealistic returns. 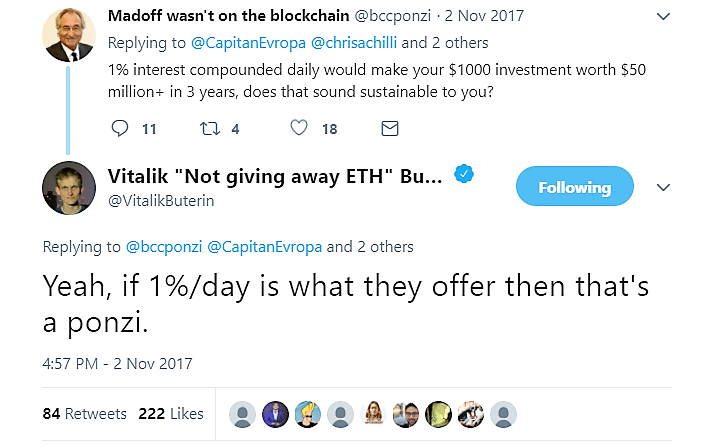 A famous example is that of BitConnect, which offered its investors up to 40% per month in ROI, guaranteeing a minimum profit of 1% compounded daily. This means that a $1,000 investment in BitConnect would potentially be worth a whopping $50 million only 3 years later – a stupefying feat to say the least. In Denver, Colorado, Dillon Dean, founder of Longmont’s The Entrepreneurs Headquarters went missing amid reports he was similarly fleecing investors by promising unrealistic returns on their bitcoin investments. 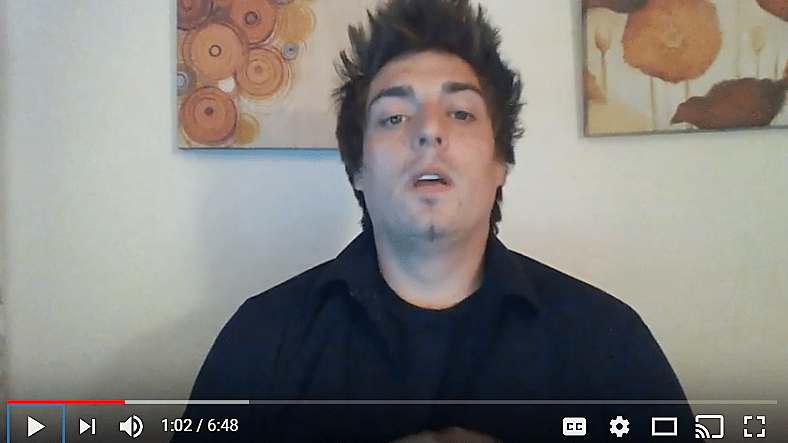 Dean ran a Facebook group and used a series of YouTube videos with titles like “How to Make $800 in 30 Minutes” to “demonstrate” the prowess of his trading skills to potential investors, all the while keeping money given to him for his own personal use. More recently, owners of a multi-level marketing (MLM) cryptocurrency operation in India were arrested and charged with financial fraud. The company, known as GainBitcoin, guaranteed 10% returns per month to its investors who agreed to plunk down 1 BTC for an 18 month “contract,” at the end of which their bitcoin and promised gains would be returned. It is estimated that some 8,000 participants were duped out of their funds, collecting a total of approximately $56 million worth of bitcoin. The potential for Ponzi-like fraud with cryptocurrencies is helped by its anonymous features, which make it harder for government officials to track down culprits. The problem has become so severe in the impoverished nation that India has outright banned cryptocurrency use by businesses in an attempt to curb related fraud activity. Another tactic used by scammers involves the employment of celebrities to endorse their fraudulent products. 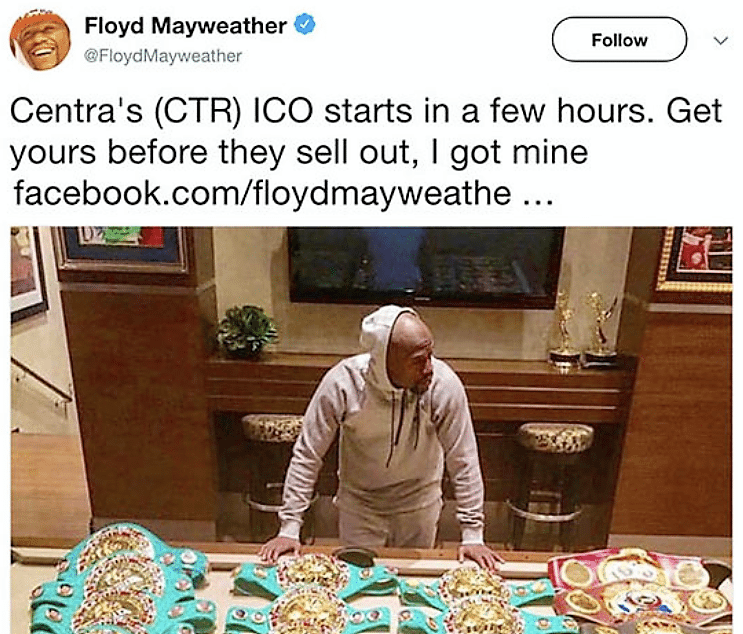 Controversial boxing legend Floyd Mayweather was hired in 2017 to wield his massive cultural influence to promote the scam ICO Centra Tech, in which investors were issued “CTR Tokens” that could not be exchanged for any other cryptocurrency and were essentially worthless. Centra Tech claimed to have pre-existing business relationships with MasterCard and Visa which were found to be totally fictitious. While Floyd “Money” Mayweather is not in the hot seat himself, his reputation as being greedy and partially illiterate should have been a tip off to those who considered investing in the now-defunct project. Fixed Returns. No professional money manager, trader or investor has a perfect track record. This is because it is simply impossible to know for sure which direction a market is headed all of the time. A promised profit is the #1 indicator of a Ponzi scheme. Huge Returns. Expecting a guaranteed return much higher than that of the going interest rates is unrealistic in any situation. Secrecy and Bravado. Beware of investment groups who refuse to share their trading methodology, post verifiable results or claim that their strategy is driven by “black box” technology. Usually Ponzi scheme fund managers will say that their methods are so cutting-edge and profitable that they refuse to release them to investors, out of a false fear of being introduced to competitors. Investment managers who become incensed at simple questions about how their operations work and insist that their reputation speaks for itself are likely operating fraudulent schemes and are not to be trusted. In short, if something sounds too good to be true, it most certainly is, especially when it comes to the world of cryptocurrency. Short of collecting interest, there are no surefire ways to guarantee an investment will be profitable. Beware of those who claim otherwise or present a suspiciously optimistic record of accomplishment of their investments. Like Bernie Madoff, con artists insist on defying statistical odds without even realizing they are doing so. Unlike Bernie Madoff, the anonymity of cryptocurrency provides a mean for their easy escape once the jig is up, and suckered investors will be left with nothing, or at best, holding a bag of worthless tokens.